Federal judge rules that aides to former Secretary of State should be questioned under oath. 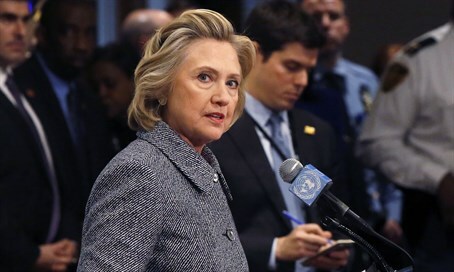 A federal judge ruled on Tuesday that State Department officials and aides to former Secretary of State Hillary Clinton should be questioned under oath about whether her private email system was an effort to skirt open records laws, Reuters reports. According to the news agency, U.S. District Judge Emmet G. Sullivan ordered that the State Department and Judicial Watch, the conservative watchdog group suing the department for records about the employment of a senior Clinton aide, come up with a plan for the depositions and other discovery by April. Clinton's use of a private server in her New York home for her government work is being investigated by the Federal Bureau of Investigation, the State Department's internal watchdog and several Republican-controlled congressional committees. She has apologized for the use of a private email server, even though she had insisted she didn’t need to apologize because "what I did was allowed." The State Department said Tuesday it was reviewing the order but could not comment further on ongoing litigation. The department may appeal the ruling. Tom Fitton, Judicial Watch's president, called the ruling "a major victory for the public’s right to know the truth about Hillary Clinton's email system." His group will propose that the testimony include former State Department officials, and may also seek to have Clinton give testimony. "While Mrs. Clinton's testimony may not be required initially," Fitton said in his statement, "it may happen that her testimony is necessary for the Court to resolve the legal issues about her unprecedented email practices." The group is suing the department in its effort to get hold of public records about an arrangement it made for Huma Abedin, long one of Clinton's closest aides, to simultaneously work for Clinton's charities and a Clinton-linked consultancy firm while also for Clinton at the State Department. Abedin is now the vice chairwoman of Clinton's presidential campaign. While Clinton has denied that she sent or received classified emails from her private server, it was revealed last month that some of her mails were beyond "top secret".